This week I was kindly invited to return again by the Monticello Bird Club for their third annual Bird photography contest. I’m honored that they consider my insight as Judge for the contest worthy for the event. I am thankful for the opportunity to be with them and it’s always a special visit for me. There were some amazing submissions from the club members and with camera equipment that wasn’t fancy at all. It shows that the patient bird watcher can take wonderful bird images without having to sell off their first born for their camera gear. I also love it as I take advantage and get myself off grid and take the long way home through Shenandoah National Park. Spring is just starting to appear and the main hotel properties are still closed for guests which meant that Skyline Drive was quiet at night as only campers were staying within the park. I managed to get a last-minute cabin at Lewis Cabins & Campgrounds at mile 57, so with my late arrival I was excited with the prospect of the beautiful dark sky filled with sparkling stars. 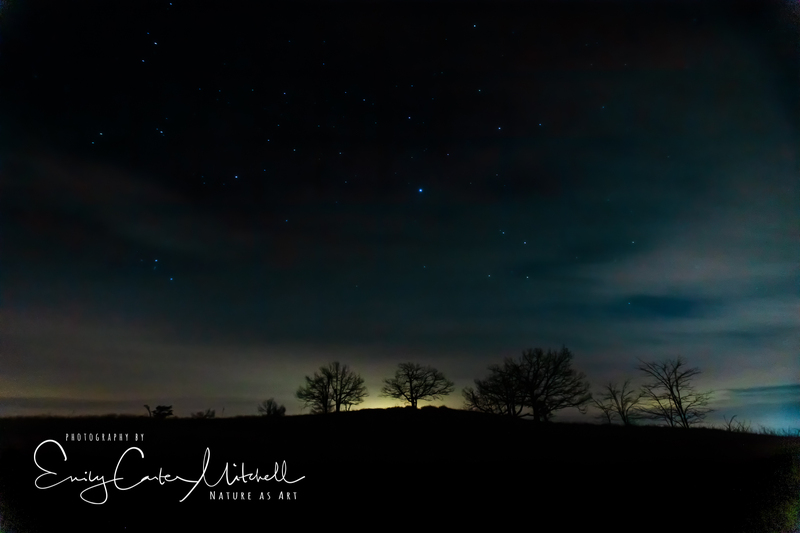 It is the new moon this week and it’s not too easy to find a dark sky in my heavily populated area near Washington D.C. Shenandoah National Park is one of those rare places that isn’t too far from where I live where I can find a mostly dark sky. The Dark Sky App for both iOS and Android that you can take with you when on the move. The next app that I use is Photo Pills photography App which is an incredibly robust, all encompassing tool on your smart device that helps with planning, plotting, etc. for a wide variety of photography techniques. Within the app there is a “Live Night AR” which helps you to point the phone to the sky to pin-point exactly where the Milky Way is and its Galactic Center. 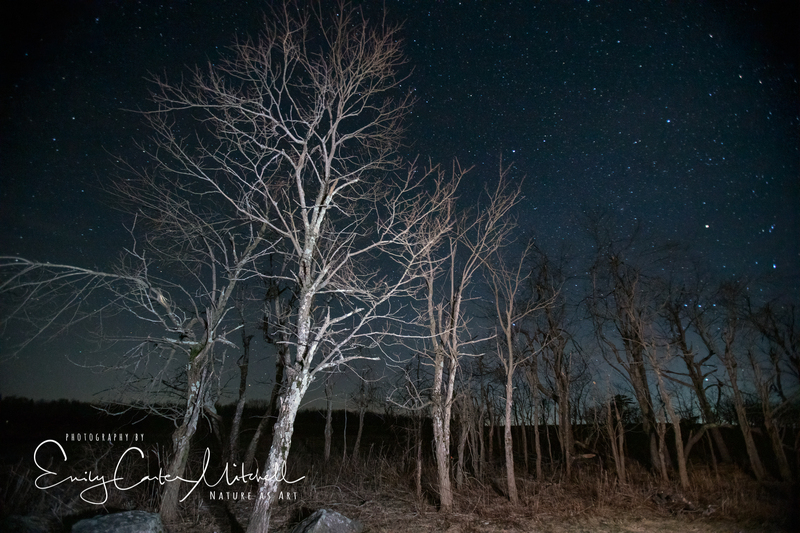 Once I got checked into my cabin I went on my Night Game Drive on Skyline Drive towards Big Meadows Lodge and at one of the overlooks I stopped by an interesting tree. Looking out, I happened to notice my brake lights illuminating the tree. 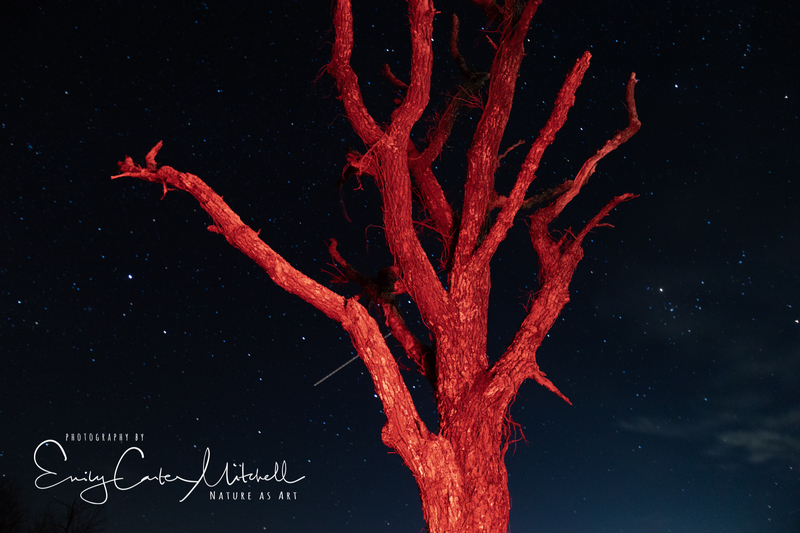 So I set up my 16-35mm wide angle lens on a tripod with a 10-second timer then rushed into the car to press the brakes to shine the red light on the tree. It really was a night game drive as all of the creatures of the forest come out at night and love to take over the road. I must have seen over 30 deer, five Raccoons, three skunks, three Barred Owls, a Bunny Rabbit and heard a Great Horned Owl. It was just the creatures and I, in the dark.. on the road..on the forest covered mountain top. The air had a gentle breeze which is unusual as it’s usually blustery on top of the mountain range. It wasn’t terrible cold and I was layered up nicely. And so I continued on down the road rejoicing in the clear skies and planning on my Milky Way shoot which would begin around 2:00 a.m. I stopped once more to play with Light painting on a stand of trees with the stars in the background. Using an Energizer 315 Lumen headlamp with red light the technique for light painting is just as you can imagine. You quickly illuminate the elements of your subject while the camera is on a long exposure and then stop to not over illuminate. After my scout, I returned to the cabin for a brief rest and headed back out again only to see that the clouds had set in. Not all the plans come together as you had hoped. So I played with some trees silhouetted by the distance city lights and came up with one at the beginning of this post. The night images were taken at f/2.8, 30 seconds at ISO 3200. I manually dialed in a white balance of Kelvin 3400 and used manual focus. Even though the Milky Way was a bust, the night game drive back to the hotel made it totally worth it. Setting my alarm for sunrise I thought myself how nice it would be just to sleep in, but you only live once and I wanted to enjoy my short visit in Shenandoah as much as possible. Continue my little adventure with me tomorrow as we break the day on the meadow. Thank you, Emily, for taking the time to visit Charlottesville to judge Monticello Bird Club’s 2019 Bird Photography Contest. Your evening presentation to our members was entertaining and enlightening. Your enthusiasm for photography and for the natural world is infectious. It was truly an honor and I can’t thank you enough for the opportunity Maynard. Wonderful to see you again as well.